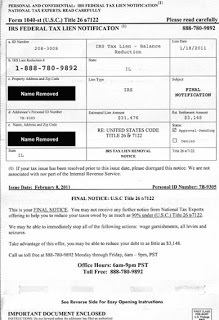 Receive a Fake Tax Lien Notice Like This? CLICK TO ENLARGE. It's not from the IRS. It's from a new company in Los Angeles called National Tax. Pretty deceptive, huh? From what we can see, this new National Tax, Limon Whitaker (also in Los Angeles) and Advocate Tax Relief in Illinois are sending these letters to people who have tax liens on them. Interesting marketing trick -- We are not really confident that these companies are run by highly trained licensed tax professionals -- buyer beware. Check them out on our list - 160 Tax Relief Companies. Washington Tax Services doesn't mail to or call people with tax liens. Have a tax problem you want to figure out? Call us at 1-888-282-4697 or email us a description of your tax issue and we'll contact you.